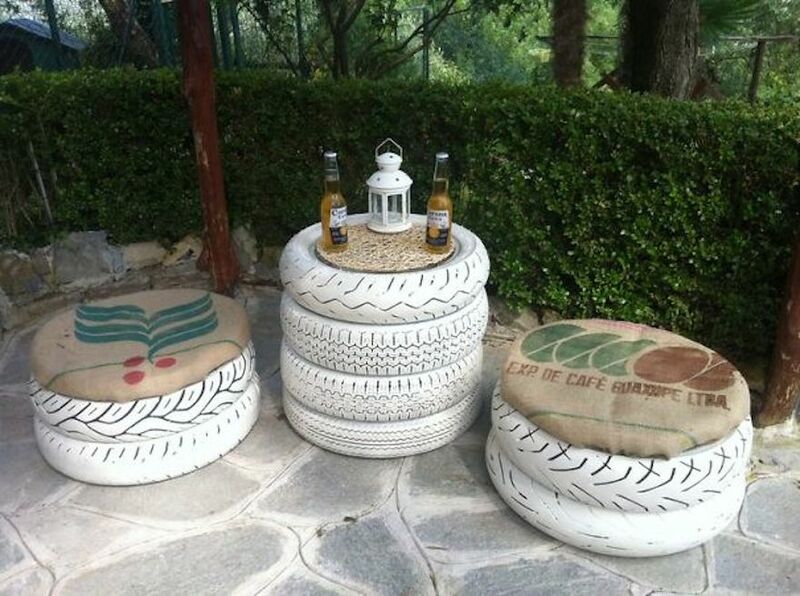 Use your old tires to decorate and create some innovative ways of using recycled items around your home. This article will give you some ideas. 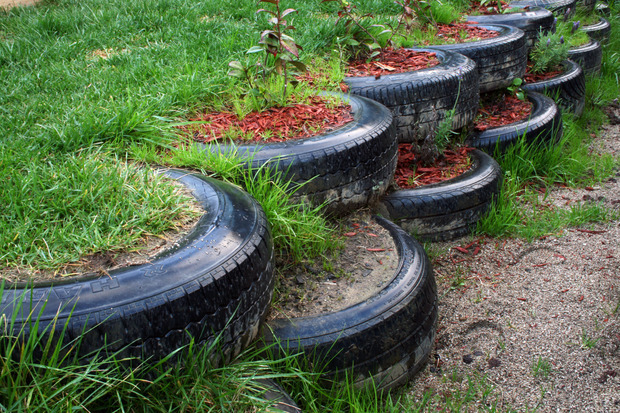 It’s unfortunate, but often times old, worn tires end up in the landfill after they’ve been replaced. Some auto shops will recycle the tires, but still too many end up taking up space in landfills. You can easily request to keep your old tires, but you’d probably be wondering what on earth you could do with a bunch of extra worn out tires. Aside from taking them to a recycling center yourself, you can also use them as the basis for DIY garden decorations and furniture. We’ve taken the time to search the wide world of the Internet for some amazing projects and ideas for you to recreate with an old set of tires. 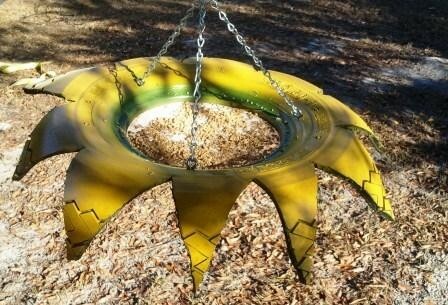 Some of these projects are a little more time consuming and difficult than others, but each idea results in a fantastic item that will look amazing in your yard. 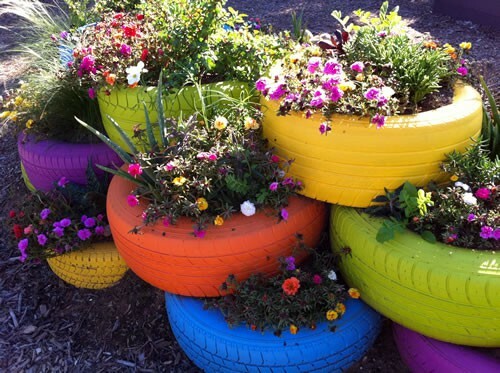 You won’t believe how fantastic tires look in a garden. We hope you find inspiration within this gallery! Tires make a perfect, sturdy base for armless, backless stools and a slightly narrower table to go between them. This small set would look perfect tucked into a nook of your patio. To get a shabby chic style, choose burlap cloth with a vintage logo or a colorful design. Beneath it will be a sturdy, yet soft pad. You won’t believe you’re sitting on stacked tires! 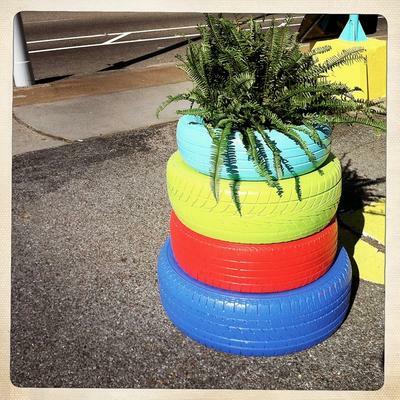 Choose bold colors and paint old tires before stacking them in an attractive shape or pattern. 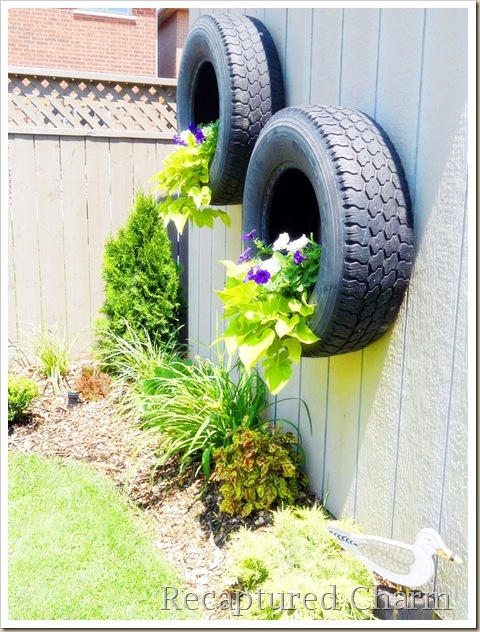 You can then plant a variety of flowers in the exposed centers of the tires, creating a tiered, colorful display piece that will look fantastic from any side or angle. If you create a taller piece, you can use it to visually separate two seating areas within your garden. It’s not necessary to paint your tires for this project unless the dark charcoal color doesn’t go well with your fence the way it does with this light gray one. When hung on the fence, the bottom of the tire is the perfect spot to add trailing vines and flowers to create a cascading effect. Stack tires of different sizes to create a topsy-turvy tower, or use tires of the same size to create more of a pillar. At the top, plant a bushy fern or other plants that will add volume to the top or trail down the sides. Be sure to paint your tires to match your color pallet! 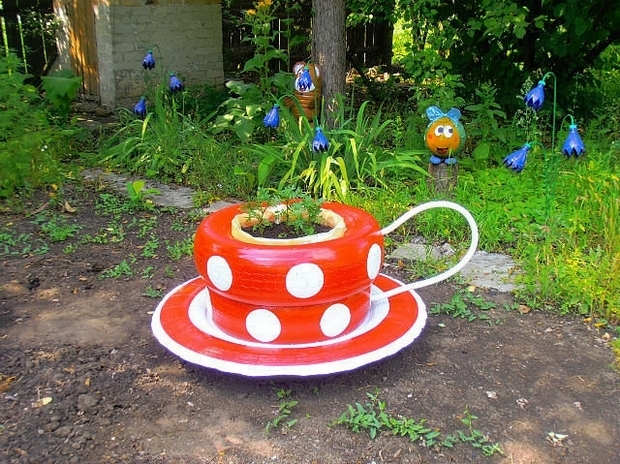 With a few extra materials, you can design a stacked tire ornament that looks like an adorable giant-sized teacup! Be sure to add a saucer and handle to keep it from looking more like a mushroom. 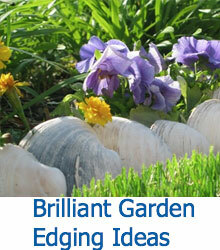 Use bold colors to paint an eye-popping pattern that will make it the centerpiece of your garden! You probably would never think to make a tiered fountain out of tires, but yet here it is! 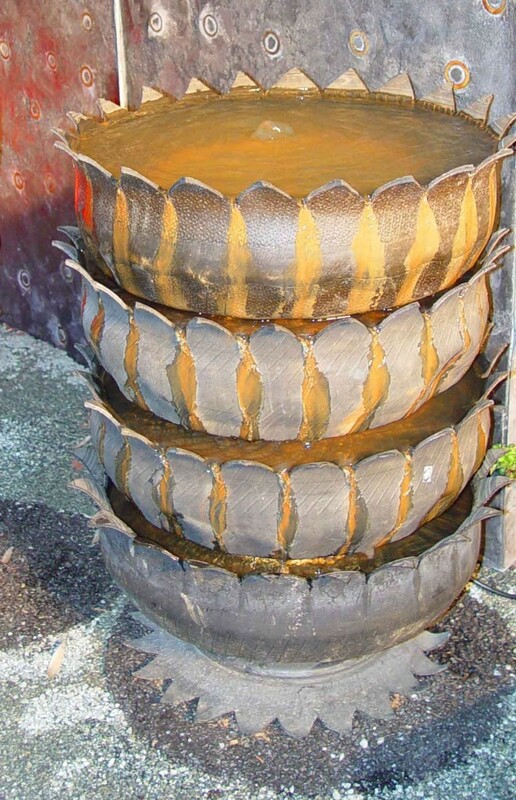 Cut and extend one rim of each tire into petal-like formations, paint the pieces, and stack them to get the basic idea of how your fountain will look when it’s finished. There’s nothing quite like the soothing sounds of a water feature to make your backyard feel like paradise. 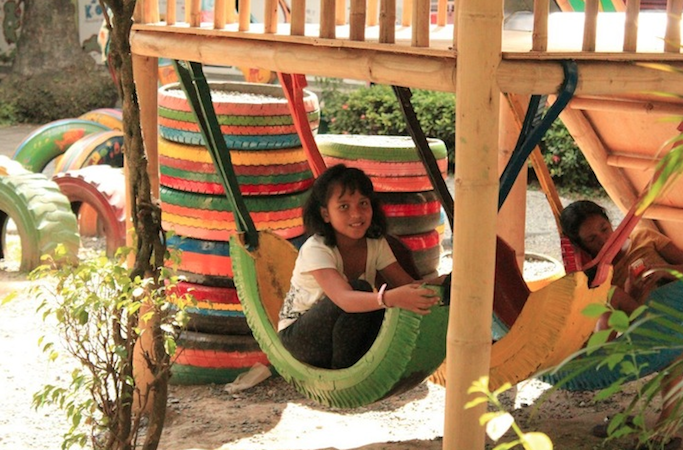 Kids are just the right size to fit into these brightly colored hammocks constructed out of old tires. Paint the tires to give them a more festive appearance, then use sturdy rope or bands to attach the hammocks to the underside of a play structure or between two sturdy trees. Your kids will love them! 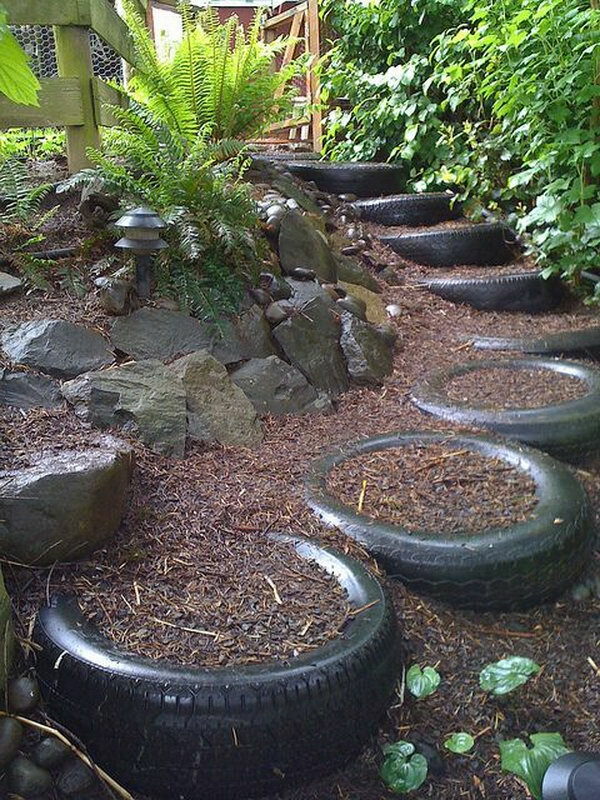 Line up old tires on a hill where you’d like there to be steps, then fill them with soil and bark to create a sturdy pathway that you won’t have to worry about washing away during a heavy rain storm. Be sure you partially bury each tire so they won’t budge. This is an easy way to create safe steps down a sizable hill on your property. Sure, it’s not too classy to keep old tires in your yard normally, but if you have the talent and vision to turn old tires into a beautiful sculpture like this one, we’re sure your neighbors will give you a pass. 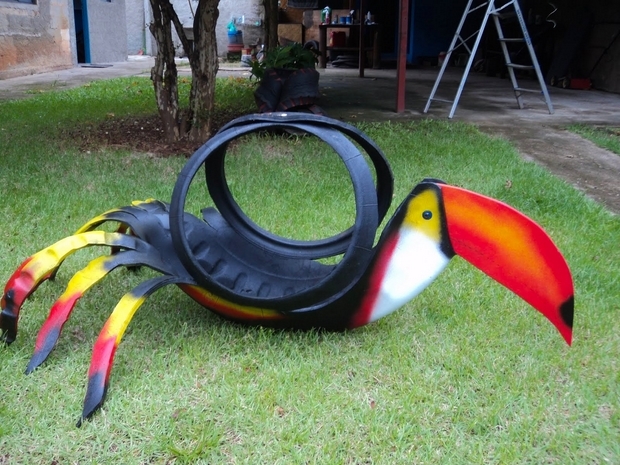 The bold colors and textures are made even more astounding knowing that this sculpture was created from a single tire. If you have a properly sized tree with a sturdy enough branch. 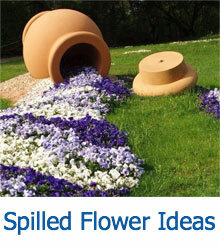 If you want to get more creative with your feeder, cut it to shape and paint it, like the one above. Your swing will resemble a sun! These retaining walls are constructed much like steps: partially bury each tire in the hill, and fill it with soil and bark. Continue stacking until your wall is as tall as you need it to be. 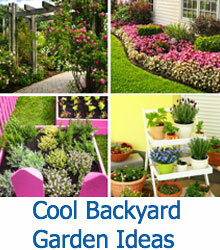 Let grass grow in the centers of each tire, or plant flowers and other plants to get a more landscaped feel.